“The Rules of Engagement” was a hit! 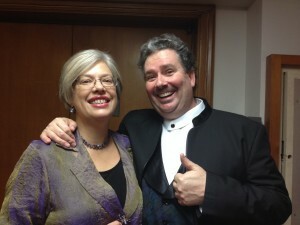 Fellow UT prof and wonderful baritone David Small and I inaugurated this program last night. We had been feeling good about it, and a very gratifying response from our crowd seemed to say that they found it effective as well. David sang beautifully and movingly, and I got to enjoy a great piano as we made our way through three centuries of music about love and war. David chose our encore at the last minute: Billy Joel’s “Lullaby.” An evening that includes Schubert, Schumann, and Strauss, alongside Weill, Berlin, and Billy Joel – not to mention two composers sitting in the audience – that satisfies! A beautiful end to the recital mini-marathon. I’m one lucky piano player.